Back to a time when I counted Annabelle’s month birthday’s and celebrated each one of them, SO thankful that God allowed her to live another month. Today is Annabelle’s “19-month Birthday.” I’m still thankful for each month, but they go by fly by these days much faster! Some days I even have to stop and think for a second to remember how many months old she is. But being back here reminds me of the sweetness of each day, no matter how frustrating and trying they might be. So… Happy 19-month Birthday my sweet, sweet Annabelle!!!! She lost weight again yesterday. Back down to 9.4kg. Peed a little better yesterday, but still much lower than what she “should” be, so we gave her an extra dose of Lasix today as well. Funny: The nurse noted that Annabelle’s pattern is that she pees some during the day, but goes the whole night without a wet diaper. Her 5:00 feed will be at a lower dose/higher calorie formula. Please pray that she takes it well, that her belly doesn’t hurt at the higher calorie amount and that she GAINS WEIGHT with it! Melissa (Anna Reese’s momma) and I spent a few late-night hours chatting last night downstairs. I absolutely hate that our babies have to be in the hospital. But if it had to happen, I’m thankful God arranged it to be around the same time. It’s nice to have a friend here. Speaking of, please keep miss Anna in your prayers! 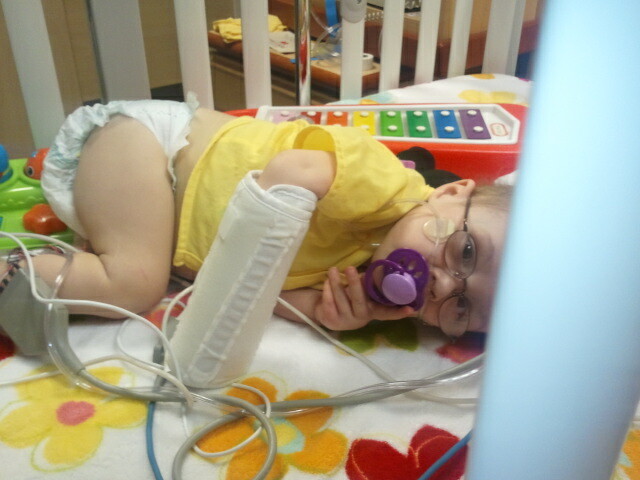 She’s down in the PICU and having a much harder time getting over her virus than Annabelle. (She doesn’t have RSV, but something super similar.) Lots of prayers needed!!!!! But, I’m learning that I need to accept where offered, and that sometimes we need things, and that’s okay. That’s what the kingdom of God is about, helping each other. I’m looking forward to a time where I’m in a position to be able to “give” back instead of always “getting”! Okay, maybe this isn’t big news to y’all, but I’m SUPER excited! It is tooth #5!! And her FIRST tooth on the top! She now has 2 bottom molars, 2 bottom (front) teeth, and 1 top front tooth. And there are more where those came front, because she’s still chewing on EVERYTHING she can find, and her gums are lots of swollen! I’ll leave you with this video. It’s kinda long… but the Minny Mouse thing… maybe it’s not that funny to y’all, but it has kept many a nurse and visitor in tears laughing. Annabelle loves her aunt Kari too! Thanks!!! We're super thankful for EACH and every month! Loved the Minnie Mouse part of the video. My boys loved seeing another video of Annabelle. Hooray for another birthday milestone. We continue to pray! Thanks, Tammi!! The Minnie Mouse part is my favorite!!! She's made many a nurse crack up laughing with that thing! Since I haven't kept up on your blog, does Annabelle have a new heart yet? She's so cute! As are your other daughters. YES! She does!!!! She received her heart on 4/9/11. She had a pretty rough ride after that, but she's finally doing better! Until this, we've been 4 months since our last hospital stay! A record! I added a spot on the top of the blog that allows you to subscribe to the blog by e-mail if you'd like! Thanks so much for your prayers! !